Now, if this were Ohio (where I’m from), I’d be sweltering and grumbling about the sweaty, makeup-melting heat by now. After all, summer starts in the second week of May over there. This being the more temperate Pacific Northwest, however, we are fully ensconced in what we Oregonians call Junuary. Yes, you read that right. “June-uary” is the month where it’s generally gorgeous and sunny the first few days, and once our hopes get up nice and high, it turns into a rainy abyss for the next 25. We all say we’re used to it, but the dull reality really doesn’t really hit us until we have a couple fantastic 70°+ days. We break out the shorts and tank tops; we even dare to get out the sunscreen if we’re feeling really spunky. Then the Rose Festival starts, and then Fleet Week, and we know it’s all downhill from there. I doubt I’ve seen a completely sunny Fleet Week, and that’s a real shame. Now that I’m past all the giddy sailor stalking from years past (Okay, maybe not completely over it! ), I found it immensely enjoyable to walk the waterfront and watch all the ships come in this last Thursday. It was a grand affair, and, well, I can’t say I wasn’t excited to see all the men lined up in their whites along the ship’s edge while they slowly came to port along the Willamette River waterfront. The Broadway Bridge lifts for a passing ship during Fleet Week. Over the weekend I was out and about among sailors and civilians alike. Friday night it rained off and on, but that didn’t stop me from having a great time with my friends and several of Portland’s finest drinking establishments. Saturday was a typical Portlandy overcast day. It was perfect weather for me to take a stroll over the Broadway Bridge. I had had a bit too much to drink the night before, and luckily was able to leave my car at the parking garage where I work downtown. Instead of taking the bus back to my car, I decided to walk. I took the same path I take every day in my vehicle, but I saw so much more. It’s fascinating to see what your eye misses when you’re driving to work every day. It’s 7:00 AM; you don’t need to see much more than the stoplights and the cyclists you’re hoping to avoid. 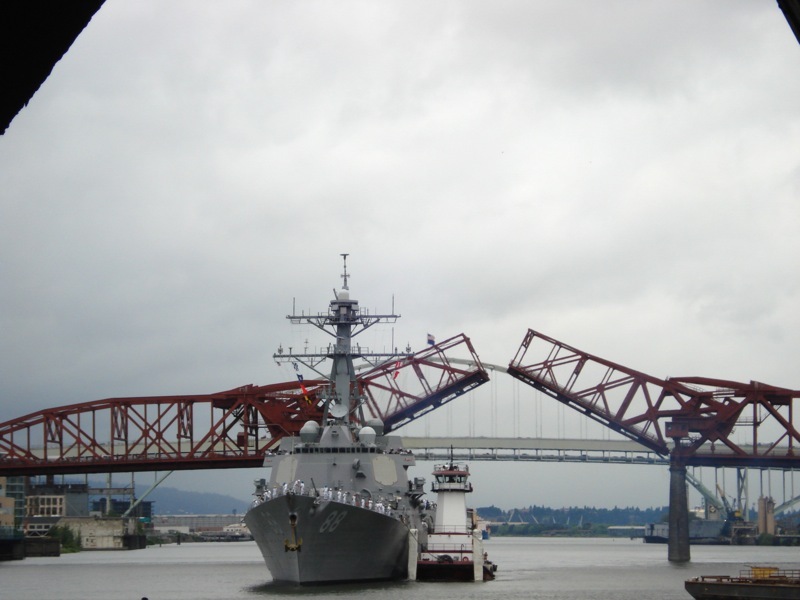 Thanks to PDX Pipeline for the Fleet Week photo. Seen on a building on NW Glisan, Portland. Thanks to David Mint for this photo. This picture was taken along my route on NW Glisan Street. 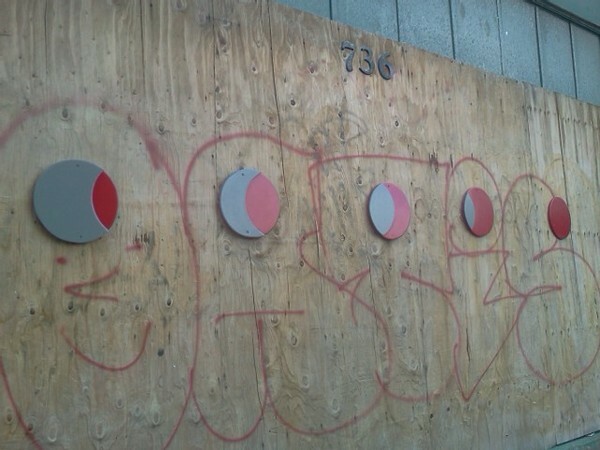 There were several sets of themed wooden artwork along an old, long-abandoned building. I never had seen the phases of the moon shown here. It made me smile and realize that this seemingly-awful hangover had a silver lining. I have lived in this city for almost nine years now, and still there is so much to explore! I have never had a fear that I will become bored here. I can honestly say that for as long as I live, I will probably always be able to find something surprising and exciting about this place. I love Portland for that.